What if you could explore Italy without the stress of reservations, tickets or travel planning? What if you had an automatic “in” to the culture, people and language? A small group tour is one of the best ways to really get to know Italy. On our small group tours you explore Italy with a local Italian guide and a group of eight people or fewer, visiting the kitchens, homes and family businesses of real Italians. Each experience is authentic, off-the-beaten-path and carefully curated by a dedicated tour leader. We like to say our small group tours give travelers the greatest insider access at the greatest value. But it’s not just us who think so – we asked our clients to share what they loved about their small group tour experience. Each traveler’s story was different, but the same five themes kept coming up again and again. Our small group tours are capped at eight travelers total. “When they say ‘small group,’ they mean small,” said fellow traveler Sarah. And there’s nothing like traveling together to spark friendship. Linda said her group touring the Amalfi Coast and Puglia was “the envy of other travelers, even Italians! We bonded with our fellow travelers immediately and laughed almost all the time that we weren’t eating.” Other travelers, including Svetlana, ended up liking their group so much, they traveled together again the following year! 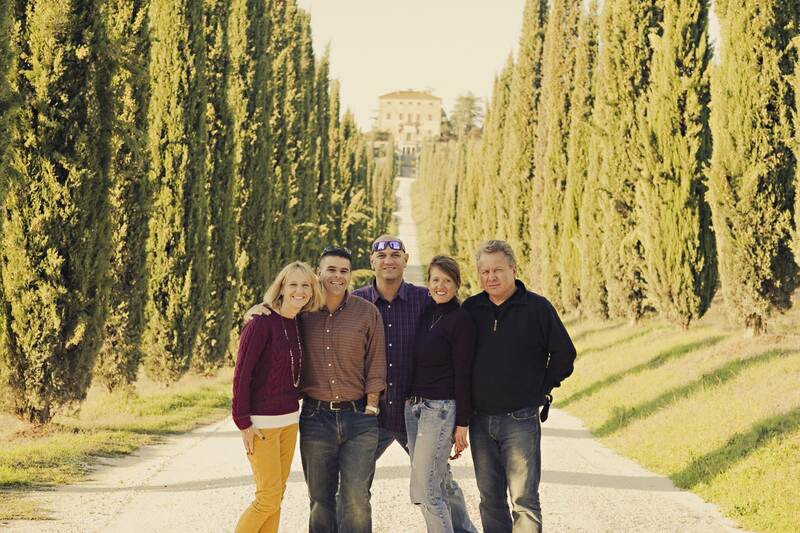 Traveler Lindsay put it perfectly when she said Ciao Andiamo co-owner Max Brunelli “knows everyone in Italy.” As the leader for many of our small group tours, Max builds lasting relationships not only with the travelers, but with the local olive oil producers, cheese makers and guides. Sarah said the welcome her group received at each of their tour stops was “indescribable,” and the whole group was “made to feel like old friends” by the winery owners and chefs they visited on her tour of Umbria and Tuscany. Your tour leader isn’t just showing you Italy, they’re welcoming you into their way of life and giving you an inside-look into the lives of fellow Italians. If you’re looking for an authentic, one-of-a-kind experience in Italy, small group tours are a great way to go. Your tour leader will take you off the beaten path to destinations you wouldn’t find on your own. “We felt like we were living like true Italians,” Meghan said, and Sarah enjoyed that there were few tourists or buses at their tour stops. 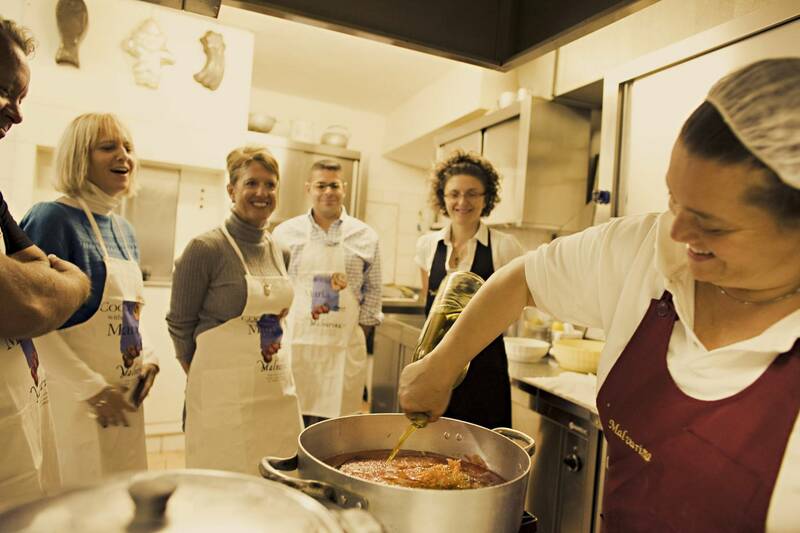 Some of our travelers favorite experiences include hands-on cooking classes led by local Italian chefs. In the town of Alberobello in Puglia, an Italian nonna will teach you to recreate recipes passed down by her family for generations inside a historic trullo home. A cooking class in Umbria takes you inside one of the region’s first agriturismi (farmhouse restaurants), tucked in the hills between Spello and Assisi, where you’ll join the owner in preparing regional delicacies. In each room of the agriturismo, you’ll learn to make a different course, with the help of friendly chefs and local wine. Make pasta by hand, bake bread in a wood-burning stone oven and use fresh produce from the farm to complement your courses. You’ll experience the romance of country life as you feast on your artisanal creations in a rustic dining room with your newly-formed friends. All Ciao Andiamo trips are designed to give you a seamless experience, but small group tours take it a step further with a dedicated tour leader who is on-hand from the moment your tour begins. Your tour leader is there to take care of every detail – transportation, hotels, food and experiences – and give the group flexibility to enjoy each day to the fullest. Beyond being flexible, your tour leader will also spend time getting to know the group and can adjust the day’s activities based on your interests and preferred level of activity. Their goal is to give you the best day possible, every day of your trip. Our small group tours include accommodations, ground transportation throughout, daily culinary and/or cultural excursions, two meals per day (breakfast plus lunch or dinner) and pick-up/drop-off in a major city. Now that you’re in love with the idea of a small group tour, check out the incredible experiences we have to offer! Explore the beautiful regions of Tuscany and Umbria on a tour of Food, Wine & the Rolling Hills. You’ll taste wine in Montefalco and Montalcino, learn to cook with a hands-on class and tour charming hilltop towns, including Cortona (of “Under the Tuscan Sun” fame) and the medieval settings of Pienza and Spoleto. For a visit to the Amalfi Coast and Puglia, join our tour of Southern Italy: Coast to Coast, where you’ll visit the unique city of Matera (a UNESCO World Heritage Site), take a cooking class inside a trullo home, visit the island of Capri, tour the ruins of Pompeii and more. On our tour of Essential Tuscany, you’ll stay in the iconic Tuscan cities of Florence, Siena and Lucca, visit the marble quarries of Carrara, view the leaning tower of Pisa and explore the walled city of San Gimignano. Learn to cook in a winery in the Tuscan countryside, enjoy a cheese-making demonstration in Pienza and, of course, taste wine along the way. Winter travelers can also enjoy the region’s festive atmosphere on a special Tuscany for the Holidays tour. Foodies will love Cooking in Italy’s Green Heart, with daily hands-on culinary experiences in the lush Umbrian countryside. Make pizza in a medieval village, craft pasta and gnocchi by hand, tour a cheese farm and create your own delicious gelato. – all paired with delicious local wines. Taste your way through Emilia-Romagna and relax on the Italian Riviera on a tour of Italy’s Finest: Cuisine to Coast. Balsamic vinegar, Parmigiano Reggiano and prosciutto di Parma are all on the menu, and you’ll visit the iconic coastal villages of the Cinque Terre. And, since your tour will start and end in a major city, it’s easy to add more traveling on your own before or after your tour. Some travelers, like Sarah, include a small group tour as just one leg of a longer trip. Ask the Ciao team for a recommendation for making the most of your time in Italy, we’re happy to help! Don’t see a date that matches your vacation schedule? It never hurts to ask! New dates may open up, or we can recommend another trip based on your interests. If you already have a group of travelers, you can also ask us how to the trip private.